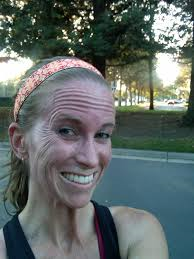 Women over 40 years of age who train really hard sometimes develop what is called "runner's face." The characteristics of runner's face are a skeletal look, sagging skin, vertical lines, damage to collagen and elastin (loss of skin elasticity), and premature aging of the face. Perhaps the jarring motion of the Marathon plus all the training that prepares one's body for the event cause the fat pads in the cheek to atrophy and then to sink down because of gravity. But one thing is for sure - there is a loss of volume in the faces of inveterate women runners, and some men too. It is not attractive. But then who established the rule that all women have to be attractive and smile a lot. Why should a woman be penalized for having a bony face and a ruddy complexion? There's no legitimate answer for that question. I've written many times on my discussion forum that women who have 17% or less body fat will stop menstruating. Perhaps that pronouncement is true often enough but it certainly is not true all the time. In this article I'm going to try to make a more nuanced explanation of the problem. First of all, most of the articles dealing with the problem state that low body fat is responsible for irregular menstrual cycles or no menstruation (amenorrhea). Probably a better explanation of the cause is a poor energy balance - expending more energy in a workout than the calories that are being taken in. Another explanation might be that a person is falling below her ideal weight - her set point. If a person 30 or 40 or beyond is interested in looking good and keeping in peak health, I don't think that intense workouts - like jogging for 90 minutes - are the answer. Older people who take their diets and workouts to the extreme are not necessarily healthier than the ones who take it a little easier. And they certainly do not look any better even though they might have a few trophies on the bookshelf. Those twice a day super long workouts in the sun certainly don't help the face maintain its youthful look. And they probably don't help the body stay in a healthful condition either.